My sister requested that I make a balaclava for her pals' son. I raked through my vintage patterns and came across one. 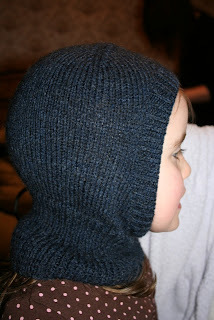 It knitted up really quickly in Sirdar Bonus Value - a dark almost tweedy blue colour. 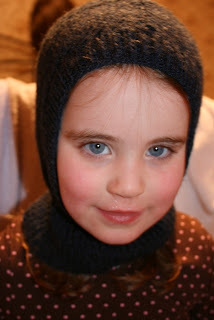 Here is my daughter modelling it. From the front. Excuse the runny nose, it's just that time of year!